Casa Manoli is located in the heart of beautiful Varenna Italy overlooking Lake Como and the Alps. Our home was completely renovated in 2015 and now offers modern conveniences to help make your visit restful and memorable. We hope you, our friends and family, love visiting Casa Manoli as much as we do! Experience old world charm and stunning beauty without sacrificing comfort or convenience. Casa Manoli is built with the finest Italian craftsmanship, modern fixtures, furnishings and linens. The home is located in the heart of scenic Varenna within steps of everything you need for a memorable, restful visit. Convenience shops are located within a block for staples such as milk, specialty breads, coffee, wine, fresh fruit, vegetables, meats and cheeses. Enjoy early morning espresso and fresh pastries in the town square. Stroll beside the lake to select a quaint restaurant for lunch or simply enjoy the peaceful view from your own private covered terrace. You can easily stay at Casa Manoli without renting a car. 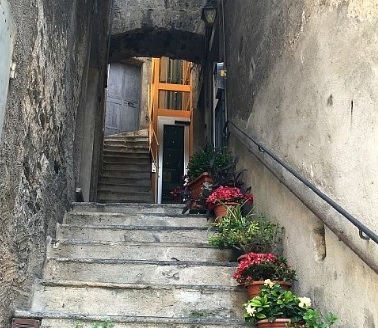 The train that arrives in Varenna from the Milan train station (Milano Centrale) is within walking distance and taxis are available. Stroll to the ferry dock for a day trip to neighboring villages and do some local shopping along the way. Varenna restaurants are plentiful. Try a new one every day and forget about grocery shopping. Wander the town, the shops and the beaches with Casa Manoli as your home base. The steps in this photo lead to the front door. The elevator is on the left. Great books and works of art have come to life in this region. And no wonder--it's beauty will change your outlook. Take a break from work, email and social media. 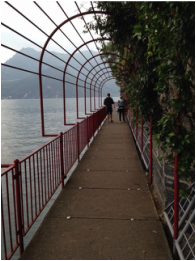 A breezy stroll along Lake Como is perfect for conversation.